I was quietly amused upon discovering the “visual shelf” in the Library Catalogue section of my new school’s website, especially as this coincided with the readings on virtual libraries. 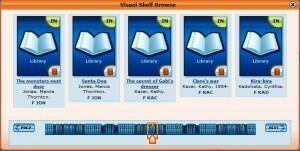 Aside from looking up books using a standard search of title, author, or topic, students and staff can browse the shelves either from the computer or the comfort of their own home, by simply sliding a box along the image of a shelf of books. However, is this a virtual library by any means? It may be designed to appeal to the computer-savvy nature of today’s child, yet the child still needs to move out of the virtual shelf into the actual school library in order to find the information they seek. The simple definition, that of the collection of materials found on the Internet, is exactly that: too simplified. Yet when one uses a search engine on “virtual libraries,” one finds a barrage of results that use this definition of a virtual library, most of them categorized by subject matter or educational institution. The site that claims to be the “WWW Virtual Library” is simply a series of tiered, nested categories that eventually result in several collections of links. (WWWVL) This example is in no way universal in its scope, as it is monitored by a small group of people who determine what should be included and what should not; nor does it even meet the simple definition of being the collection of materials found on the internet. Gapen’s definition seems a little more realistic and a little more usable in today’s world. Unlike O’Donnell, her definition allows for a sifting mechanism of sorts in that her virtual library is limited to “current and heavily used materials.” (Martell) However, who determines what materials will be heavily used? In other words, who determines what will be in this virtual library? Gapen herself describes the virtual library as a “library metaphor for a societal control revolution,” (Martell) implying that some group somewhere is imposing their beliefs on the library consumers. The current state of the Internet exacerbates the problems both O’Donnell’s and Gapen’s definitions of the virtual library in the sense that there is an overabundance of information and, as yet, no effective way of accessing accurate information quickly and efficiently. It is by far much easier and faster to find information than by the previous methods of the past, yet it is still far from perfect, and as O’Donnell suggests, once we get close to the ideal virtual library, new technology will be in place that will make that ideal obsolete. I am grateful for the access I have had to my university’s online library and I cannot imagine how I would have completed my assignments without it. If the next change makes my research easier then I will welcome it, but I hope that online libraries will become less restrictive so that access in the future will be for all and not just for an academic elite.